Extremely peaceful and tranquil location. 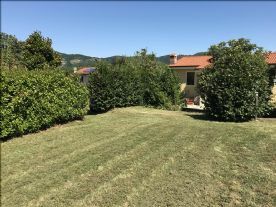 Beautiful detached Tuscan house located in the sought after medieval town of Barga and perfectly located to the famous & historic locations of Tuscany such as Lucca, Pisa and Florence. The house was purchased by the current owner in 2007 and has been completely, extensively and professionally renovated and refurbished to a very high standard throughout, with high quality fixtures, fittings & furniture. 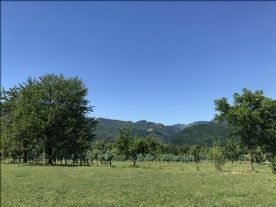 The sale of the property includes the complete fixtures, fittings and furniture and therefore a beautiful ready made home, holiday home or holiday rental property. On the ground floor the house comprises of a large kitchen & dining area, two living rooms, toilet and shower as well as a small closet. In addition to gas central heating throughout the house there is also a working open fire place. The first floor comprises of three bedrooms, one of which is en-suite, family bathroom, living room with TV, DVD, surround sound, Sky satellite ready as well a second working open fire place. The two floors can both be accessed by their own main doors, one to the side of the house and one at the front of the house, and is internally accessed by a hand made spiral staircase. Outside at the front of the house there is a utility building with a washing machine, clothes drying machine, and storage area for the patio and garden furniture. There is also a separate outside toilet and shower at the rear of the house. The house was fitted with a new roof and gutters in 2016 as well as the external walls painted. The house is fitted with CCTV with three outside cameras and one camera inside the garage at the front of the house. The CCTV can be viewed remotely when connected to Wi-Fi. At the front of the house is a beautiful patio area with plants and flowers, and at the rear of the house is a garage. The patio area is fully lit with high quality outside lighting. 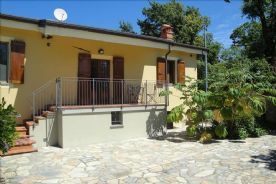 In immediate proximity to the house is an old barn which comprises of two floors. The ground floor which is accessed by the patio area has a garage space and also an original pizza oven. The second floor accessed by the garden is used as a storage area. This barn would make an ideal separate accommodation of apartments, subject to planning permission being granted by the local authorities. The property has a large beautiful open garden area with a stunning 12x6 metre swimming pool, patio area and shower with LED lighting. 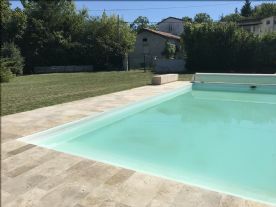 The swimming pool & patio area were built to a very high standard and includes an electrically operated pool cover and automatic robot for cleaning the pool. The pool has internal lighting and the patio area is fitted with high quality lighting. The house and garden have beautiful Tuscan views and is extremely peaceful and tranquil throughout the day and evening. The historic medieval town of Barga is approximately 2km and comprises of cafés, restaurants and a wide range of small shops including two small supermarkets and a small garage. Approximately 5km is the small town of Gallicano which has a large Leclerc supermarket as well as other larger shops. 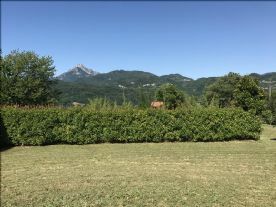 The delightful seaside resort of Viareggio is a distance of approximately 60km away, with the winter ski resort of Abetone approximately 56km away.